All weather is good weather in a Tiger Angel Guardian Suit! What can we say? 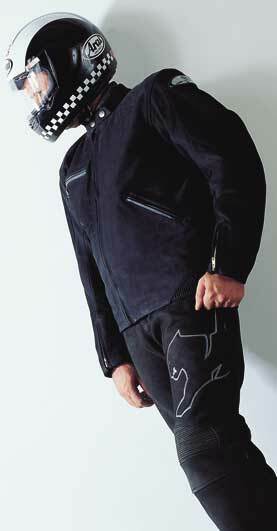 This suit is the perfect road going motorcycle garment for ALL conditions. Now motorcyclists can ride through widely varying climates with ONE set of protective clothing. From the dry searing heat of the desert to the icy cold wind and rain of the mountains, Tiger Angel's Guardian suit will keep you perfectly dry and comfortable, while featuring the same quality protection as Tiger Angel's premium sports suits! Not only that, but you can easily keep the Guardian suit clean. It is washable and dryable! The Guardian is constructed from extraordinarily strong and supple leather, with the same tear and abrasion resistance as our sports suits, and offers additional protection with Tiger Angel's Body Defence System. Now you can ride anywhere, in any conditions knowing that you have the full protection of Tiger Angel leathers. The Guardian suit protects you from cold wet conditions better than anything you have worn before. Waterproof.The hydrophobic leather outer will not absorb water, however small amounts of water will get through the seams eventually. 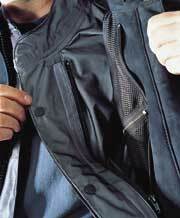 To prevent this a fully seam-sealed Gore-Tex® liner is zipped inside the jacket. The Guardian meets the rigorous Gore-Tex® performance standards for motorcycle riding in Extreme Wet weather and carries the Gore-Tex® Guarantee To Keep You Dry. Dry and comfortable. The Guardian is exceptionally breathable. 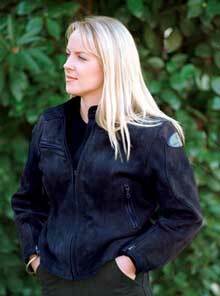 The leather is around eight times more breathable than normal motorcycle leather and the liner fabric was specifically designed for motorcycling by Gore-Tex® for breathability and durability. This means you stay dry on the inside like never before and hence there is less conductive heat loss. Just to make sure you stay comfortable the liner is also completely windproof. Now hot weather is bearable. No longer do you need to take the risk of removing your protective clothing in the heat. Ventilation. Remove the windproof Gore-Tex® liner and you have a leather suit lined with Sport-X mesh which allows excellent airflow. There is a dimpled foam back pad which sits the suit away from your skin and allows cooling air to flow through. The chest pocket is lined with Sport-X mesh and can be zipped open for cooling ventilation. The arms feature two way zips backed with perforated leather. Open the upper zip for airflow over your arms, while the lower zip keeps the sleeve secure on your wrists. Wash a leather suit ?! Yes, the Guardian suit is washable. The remarkable characteristics of the Hydrophobic Nubuck leather allow it to be hand washed and then tumble dried without harm.